We opened our doors in 2006 as a small service center for all boats and motors. We opened in a one bay shop with the owner serving as the mechanic/secretary/salesman. Within 6 months, our business outgrew the one bay shop and we changed locations to a bigger building. In 2010, Tadpole’s Marine moved once again to a bigger building with more room. In 2014, we became a Tracker Boats Dealer selling Tracker and Sun Tracker Boats. We also became a Mercury Authorized Service Center that same year. In February of 2018 we opened a second location in Hugo Oklahoma. Today we sell Tracker, Sun Tracker, Nitro, Tahoe, Regency, Grizzly, and Mako Boats. We currently have nine great employees who can fulfill any boating need. 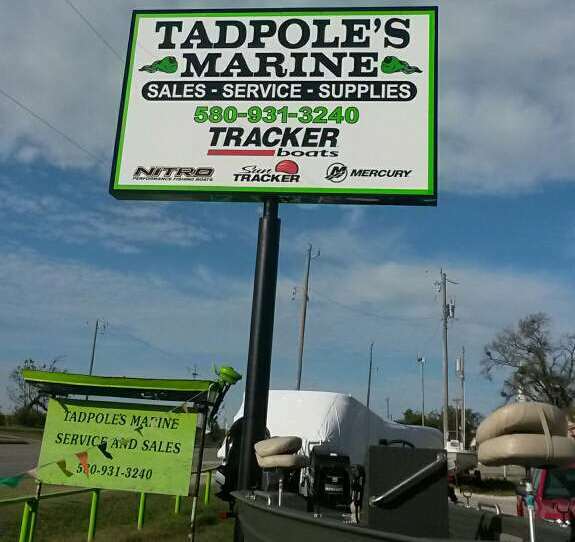 Tadpole’s Marine is a full service center and will service all makes of boats and motors up to 20 years old, with a few exceptions. We are a Tracker, Sun Tracker, Regency, Nitro, Tahoe, Mako, and Mercury Authorized Service Center. We strive to get your boat in and out as quick as possible. We have three trained technicians with more years experience than they will admit to and support from all of our manufacturers. Our goal is to keep you and your boat on the water. We are located three miles East of The Roosevelt Bridge on US Highway 70 in Mead, Oklahoma and at 2900 East Jackson in Hugo, Oklahoma. If you have any questions about your boat or motor, give us a call today.